Most SCL on-campus courses are conducted at the Georgia Tech Global Learning Center (GLC), a state of the art conference center complex, located on Georgia Tech’s new mid-town Atlanta Technology Square Campus. Classroom spaces at the GLC range from tiered amphitheaters seating 75-235 participants, to seminar and breakout-rooms seating ten participants. Regardless of size, all classrooms have state-of the art audio visual, computer and telecommunications networks which accommodate every possible learning technology. The GLC also accommodates informal gatherings with comfortable lounges, televisions and continuous/complimentary snack and beverage service. Dining service and sleeping rooms for SCL course attendees are available at the adjacent Georgia Tech Hotel & Conference Center located at the intersection of Spring St. and 5th St.
Also located in the Technology Square campus area are the Georgia Tech Book Store (operated by Barnes and Noble) and many informal restaurants and retail stores. Technology Square is also a major hub for the Georgia Tech trolley system connecting SCL participants with the Mid-Town MARTA subway system and the Georgia Tech main campus (including the Campus Recreation Center, the Student Center and all intercollegiate sports venues). To see what courses will be held on the Georgia Tech Savannah Campus, please visit the Savannah area within our website. For nearby accommodations, please visit https://pe.gatech.edu/location/georgia-tech-savannah. Some courses are taught within Georgia Tech's School of Industrial and Systems Engineering in an SCL conference room. The suggested accommodations is the Georgia Tech Hotel & Conference Center located at the intersection of Spring St. and 5th St on our Georgia Tech Trolley route. Take a course at work or in the comfort of your home! We offer our Building the Lean Supply Chain Leader course in a self-paced online format. You can start at any time and have 16 weeks to complete the 16 lessons that make up the course. 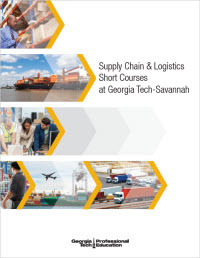 All the courses in our Supply Chain Fundamentals Series are offered in an online format. Please visit the full listing for details. If you are interested in having a course taught at a location of your choice, learn more about our Custom Programs. SCL offers focused curriculums tailored to a specific company's needs and problems which respond to the unique needs of companies and provide them with specific and in-depth knowledge of supply chain engineering and management. Custom courses work well for larger groups and we bring instructors to you to simplify travel arrangements.